Noted. | FineStationery.com: Say Cheese! While exploring the Martha Stewart Weddings website, I stumbled across this fun wedding favor idea. 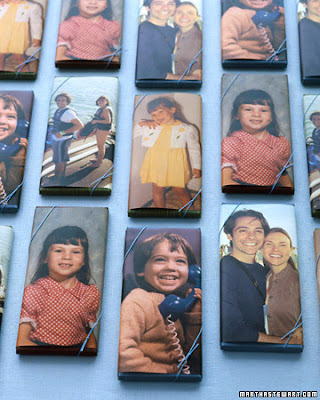 Candy bars wrapped with photos of the bride and groom -- as children, while dating, etc. How fun! Some wedding guests might only know the bride and groom as adults, so wouldn't it be fun to show off a few fun childhood photos? Select your favorite images, print them on either photo or copy paper, and wrap them around a candy bar. Tie off the bars with ribbon if you'd like, or secure the photo with tape on the back side. Ta-da! Personalized favors!